There is a popular saying that first impression lasts forever. This saying is very apt when it comes to the corporate world. Businesses want to make great impressions on their clients. They want to create a perfect brand image for their organizations and they go the extra mile to see to it that their organization is viewed in the right light. When planning a business dinner meeting with a client or a potential client, the normal thing to do is to make the best appearance. Unfortunately, appearance does not often cut the image you want to project. There are so many things to put into consideration. Where will the business meeting hold? Is it appropriate to arrange a Long Island airport limo service to pick up the client? Does the organization need to send senior executive to the meeting or should the MD attend the meeting? All these questions and many more are what require answers when planning for your business meeting. One important aspect of meeting set up that can make a whole lot of difference in the way your organization is perceived is the location of the business meeting. Many top executives believe that the best place to hold a meeting with a client is at the company’s office. The ideology behind this is that you are at your turf; therefore, you have the territory advantage and as such you can stir the discussions to favour you. In most cases, things do not work to your expectation. People do not like to be at a disadvantage. When they are, they tend to raise their defences and view every discussion through their suspicious glass. It is therefore advisable to arrange the meeting at a more neutral place. And which meeting venue is as neutral as a restaurant? To start your meeting on a very good note, choose a nice and warm restaurant for your meeting. As a matter of fact, don’t make it so stiff by calling it a business meeting; call it a business dinner. There are many amazing restaurants in Long Island that will be perfect for your business dinner. All you have to do is check the options available and choose the one that best suit your brand image and meeting objectives. Remember, no business dinner is complete without an exotic town car service in Long Island. Are you ready to check out some excellent restaurants for your business dinner? Let’s go right on! Blackstone Steakhouse is regarded as the premiere restaurant of its kind on Long Island. It boasts of exquisite architectural design with comfortable and glamorous interior. Why are we recommending this restaurant for business dinner? Well, you only need to be there to see for yourself. The huge booths offer a great ambience for quite discussion without infringing on your client’s personal space. In addition to the space, the menu is also very exceptional. Apart from the steaks, the restaurant also offers a wide range of entrees and drinks. Blackstone definitely creates the perfect atmosphere for a corporate but relaxing meeting with your client. It is essential to mention that your arrival for the meeting is as important as the venue you choose for the meeting. 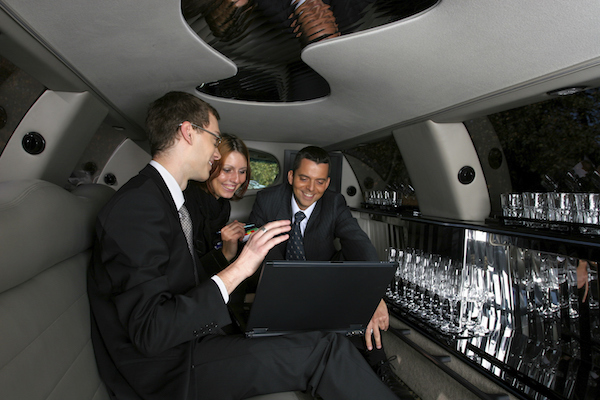 We highly recommend that you opt for corporate limo service in Long Island for your business dinner with your client. This particular restaurant is considered an excellent choice for business dinner because of its relaxed and serene ambience. Apart from the ambience, Franina also boasts of a sumptuous menu of traditional Italian cuisine. Whether you are planning a business lunch or dinner, the restaurant is well equipped to provide amazing menu options for you. It is not only about the food, Franina also offers exotic wines and cocktails to its amazing customers. You can enjoy your business discussion in a relaxed atmosphere and be treated to amazingly delicious meals. In case you are wondering about how to locate the restaurant, you can leave that to us. When you hire a luxury limousine service in Long Island, we will ensure you get to the meeting venue on time and in style. In case your client is coming from outside of the city, we can also arrange an exquisite Long Island Airport Limo Service for your client. Remember, it is all about creating a great image. You therefore cannot afford to leave your client to their fate in an unknown city. Call us today to make the perfect NYC limo service for your client. If you want a more private and personal feel, make a reservation for a table at Estia’s Little Kitchen for your next business dinner. The menu delicacies at the restaurant are majorly traditional cuisine such as grilled skirt steak, paella, and crab cakes. You can never regret choosing this location to treat your client to a nice traditional meal. Although the restaurant has a homey feel to it, you can be sure of contemporary service when you dine there. Estia’s Little Kitchen is an embodiment of great taste, personal and homey touches, and amazing service. 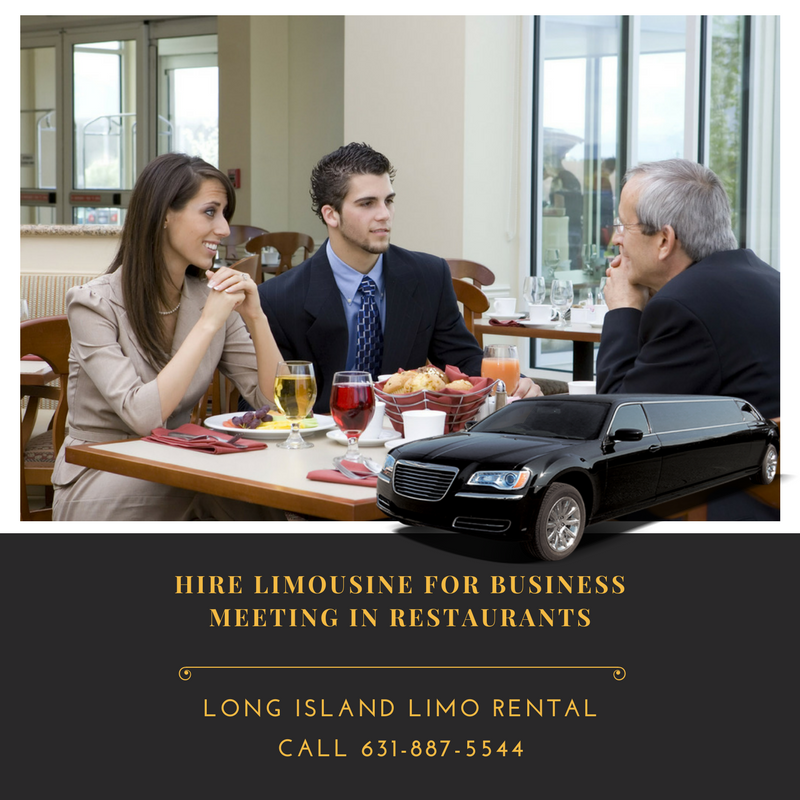 Make your grand appearance for your meeting at this restaurant in a contemporary corporate Limousine services Long Island New York. It puts you in a great light before your client and puts your organization in a reputable light before the client. This special dinner destination offers fresh seafood, with wide selections of shellfish, finfish and many more to diners. If you are planning your business dinner at the H20 Seafood Sushi, you need to be sure that your client is a lover of pure seafood because that is the main cuisine at this restaurant. Well, apart from the seafood, you also get to enjoy beautiful taste of great selections of fine wine from New York. In case you are looking for a perfect restaurant for French cuisine to impress your client (especially if your client is of French origin), Tournesol is your restaurant of choice. The restaurant menu consists mainly of French delicacies like Terrine of Foie Gras, Quiche Lorraine, and Croque Monsieur. The ambience also presents a cosy but formal atmosphere. You will absolutely love hosting your client at this location. Our professional chauffeur will be on ground to take you to your dinner destination when you make use of our Long Island Limousine Service Hauppauge. We have a wide range of limo rides that can be arranged for you. In case you are looking for cheap limo service long Island or you want to know limo service Long Island prices, you can contact us and we assure you of giving you the best available options of classy and stylish limo within your budget. Call us today to make your reservation.